FILE - A boy stands before an Islamic jihad flag. Concern is growing in Germany and other countries that the Islamic State group, now largely weakened, is actively recruiting children to carry on their jihadist legacy. "Put on a thick jacket,” the 18-year-old son of Albanian immigrants instructed the 12-year-old German-Iraqi boy over the Internet on how to carry out a Christmas market attack last year in the Rhineland town of Ludwigshafen. “Then go behind a hut and light and run,” he advised. Fortunately, the crude nail-bomb device failed to work and the 12-year-old was arrested by police in December trying for a second time to pull off an attack, this time outside Ludwigshafen’s city hall. The chilling mentoring by the 18-year-old from his home in neighboring Austria was detailed last month in court papers. In a media interview midweek, Hans-Georg Maassen, head of the Office for the Protection of the Constitution, warned that the Islamic State and the terror group’s followers are continuing to target children in Germany online. “Islamic State uses headhunters who scour the internet for children who can be approached and tries to radicalize these children, or recruit these children for terrorist attacks,” he warned. An estimated 1,000 German recruits joined IS. Only a handful of the 290 children and toddlers who left Germany with jihadist parents — or who were born in Syria or Iraq — have so far returned to Germany. And some rights activists have warned that Germany should not over-react and be too quick to alter civil liberty protections, questioning whether the danger is being over-stated. FILE - А screen grab from an Islamic State propaganda video shows an Islamic State recruiter with two child soldiers at an unknown location. Experts warn that not enough thought is being given about what to do with so-called “cubs of the caliphate” — both the offspring of foreign recruits as well as Syrian and Iraqi children enlisted into terror ranks. The threat posed by the radicalization of minors has become a major political issue in Germany. Three out of five radical Islamist attacks in the country in 2016 were carried out by minors. This is the second time Maassen has sounded a public alarm about child recruits — he last did so in October, saying he was worried about a new generation of jihadists being raised in Germany. He urged Germans to “take a very serious look” at the threat, and to call police if they noticed anything suspicious. Last year, de-radicalization experts warned that Western governments were not giving enough thought about what to do with so-called “cubs of the caliphate” — both the offspring of foreign recruits as well as Syrian and Iraqi children enlisted into the terror ranks. IS leaders made no secret of their earmarking of the young to be “the generation that will conquer Baghdad, Jerusalem, Mecca and Rome,” grooming youngsters to be the deadly legacy of a murderous caliphate on the brink of military defeat. As the terror group’s territory shrank in the face of offensives on IS strongholds in the Levant, the militants highlighted in a series of gloating videos what they hoped would be in store for their enemies. German intelligence officials aren't alone in expressing worries about the offspring of IS foreign fighters — or the continuing efforts of jihadist recruiters. On Thursday, the head of London’s police’s counter-terrorism command, Dean Haydon, warned of children trained by Islamic State coming back to Britain to carry out attacks. “Some terror groups are training children to commit atrocities,” he said as he outlined the risks posed by returnees. “We need to not just understand the risk the mother poses but the risk that any child poses as well. We look at them on a case-by-case basis and they may be arrested,” he told a London newspaper. Last month a 27-year-old British woman returning from Syria was arrested at Heathrow airport under terrorism laws. She had a two-year-old with her. Haydon revealed that police are DNA-testing children who have been brought to Britain by ‘jihadist’ parents after being born in Syria or Iraq to establish their identity. “If a mother turns up with a stateless child, born in Syria, we need to be satisfied that that child actually belongs to that mother because we have had instances of kids trying to be smuggled back into the UK but not actually belonging to that parent,” he said. 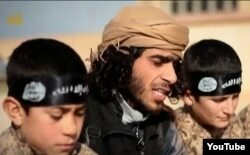 De-radicalization experts say child recruits can be rehabilitated but warn they are battling a prevalent attitude among Western officials that ‘cubs of the caliphate’ are different from child soldiers from other wars. In an interview with VOA last year, Mia Bloom, a Canadian academic, who’s co-authoring a book on jihadist child soldiers, said: “It would be a terrible mistake to think that because someone was a cub for a year or two, they are lost forever - they can be saved and rehabilitated.” She highlighted a de-radicalization program funded partly by the Pakistani army that has proved highly successful.